Most Americans grew up watching network TV, but now as they’re growing older and have more media options, are TV networks still netting viewers? The state of network TV viewing was the focus of TV Dimensions 2015, the new research annual published by Media Dynamics, Inc. It spotlighted key statistics that showed the shift in network TV demographics and provided important insight on how advertisers could evolve with the times and the trends. MediaPost.com shared the main highlights from the study to help advertisers get tuned in to today’s network TV viewing trends. The study showed that network TV viewing has decreased over the last 50 years, while the median age of viewers has increased during that time. In 1960, 92% of the average primetime audience watched the three broadcast networks of ABC/CBS/NBC and the median age of viewers was 34. In 2014, as a result of the rise in cable and other media options, 25% of the average primetime audience tuned in to the three broadcast networks and the median age of viewers was 57. This shift in the volume of viewers may be surprising, but it results from the enormous growth in modern media options. For a bit of perspective, consider that TV viewers only had three networks to watch in 1960. 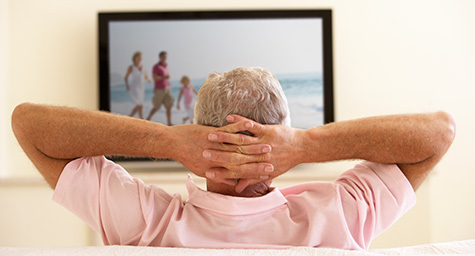 Today, viewers have countless channel choices on both traditional TV and digital media. Given this growth, the fact that network TV has retained one-quarter of the primetime audience is actually rather impressive. There is also a distinct difference in demographics, but it’s actually great news for advertisers. The 18–34 age group is no longer the demographic preference of brands and very few focus exclusively on this age group. Today, most brands earn the majority of their sales from adults over age 35, who continue to watch many network TV primetime shows. This works to a brand’s advantage because they can reach this older demographic by advertising on network TV. And brands can also reach younger viewers via network TV, but yet their channels of choice include the three major networks, along with smaller networks like Fox and CW, plus cable channels. According to industry experts, advertisers simply need to evolve with this new view of network TV viewing. They must pay attention to all audience segments, not just Millennials, by using a targeted mix of media that includes the major TV networks, along with other newer channel choices. “You may not be able to rely completely on ABC, CBS, and NBC prime-time shows any more, but it doesn’t mean that they’ve lost their value, either,” said Ed Papazian, president of Media Dynamics. Discover what’s new in media. Contact MDG Advertising today at 561-338-7797 or visit mdgadvertising.com.